From preserved masterworks to carefully updated time capsules, these homes have one thing in common (other than a healthy appreciation for everything Eames): the conviction that the '40s, '50s, and '60s were the most outstanding moments in American architecture. Jessica Helgerson Interior Design, with project manager and lead designer Emily Kudsen Leland at the helm, remade a 1950s Portland abode by a celebrated local architect with a crisp paint palette: Benjamin Moore’s Wrought Iron for the cladding and Venetian Gold for the front door. Landscape design is by Lilyvilla Gardens. When writer Robin Maguire and her husband, film financier Marc Schaberg, decided to transform a 1950s California ranch into a clean, minimalist home, their main concern was opening it up to the environment. Nestled at the bottom of a valley and facing the Getty Museum, the house embraces its scenic setting with skylights, sliding glass windows, and a garden pool. 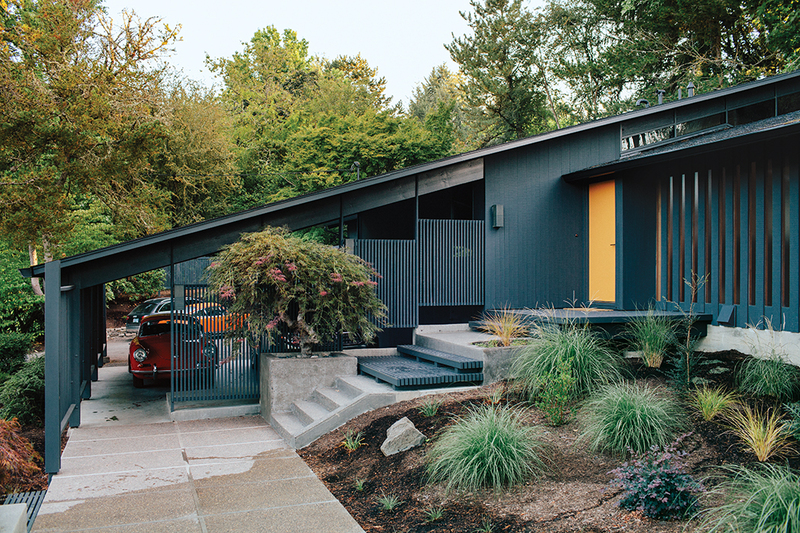 Jennifer and Mattias Segerholt's midcentury house in Portland has a distinctly Eichler-like bent. “We’re trying to pretend this is our little ray of sunshine in the middle of Portland,” says Jennifer. The sofa is by Florence Knoll for Knoll. In Menlo Park, California, a retired couple set out to add space and function to their cute but compact 1950s ranch home. They teamed up with Terry & Terry Architecture, who conceptualized an extension that was comprised of two “floating volumes” cohesively woven into the fabric of the existing home. An architectural designer and an artist harnessed the collective power of their design firm to remake a dilapidated midcentury gem in Austin into a hillside perch for their family. Dieter Rams’s modular 620 Chair Programme, from the 1960s, takes center stage in their living room. For Jerome Buttrick of Oakland based Buttrick Projects, the aim of this renovation was simply to update a well-designed midcentury home. Situated on a steeply sloping lot, the home boasts views of the Bay from the comfort of a sheer buttressed living room, a move inspired by the one from the original plan. With the help of salvaged materials and furniture, this Hawaiian home achieves what's often impossible: modern elegance but with a comfort that feels immediately worn-in and familiar. “If we couldn’t get a door or window from Re-Use Hawaii, we got it off of Craigslist—none were bought retail,” explains the architect, Fritz Johnson. The original house—a 60s “salt box” Oahu tract home—came with a charming midcentury facade that the homeowners wanted to preserve in the remodel. Margaret Riley purchased a 1957 ranch with little panache or pedigree, but a plum location just two doors down from Crestwood Hills, the Los Angeles cooperative development revered for its wealth of A. Quincy Jones masterpieces. The home had comparably little going for it, so, in 2008, she hired architect Cory Buckner to devise an addition and remodel inspired by the icons nearby. The renovation added a second floor, butterfly roof, redwood siding, vertical louvers, Douglas fir ceilings, elm built-ins, and sliding glass doors–all of which appear original. In the living room of a 1960s remodel near Seattle, the fireplace was powder-coated orange to complement the vintage furnishings. The sofa is from Design Within Reach; the coffee table is by Alexander Girard for Knoll. A pair of undated paintings by Arthur L. Kaye hang on a wall painted in a Benjamin Moore hue custom matched to the outside of the window frames. The triangular nesting tables are a vintage find. “They’re always billed as ‘guitar pick tables,’” resident Sally Julien says. The architects of Austin-based Webber + Studio were asked by a recent divorcee, seeking a home for her three daughters and dog, to renovate a 1968 A.D. Stenger home and double its size by adding 1,500 square feet. The architects emulated the home’s Japanese-inspired elements and referenced other Stenger houses in the area to produce a tasteful homage to a classic modern style. A highly productive collaboration among a trio of creative Angelenas—and a good dose of Barragán—turned a dark and beleaguered midcentury house into a colorful family home for the ages. In 1962, Skidmore, Owings & Merrill architect Arthur Witthoefft won the AIA's highest honor for a home he built in the lush woods of Westchester County. Having fended off a developer's wrecking ball, Todd Goddard and Andrew Mandolene went above and beyond to make this manse mint again. A brightly colored door beckons guests into this midcentury renovation in Austin. Its shade of turquoise is like Benjamin Moore's Americana, but with stronger hints of green. For more homegrown architecture, read up on our recent issue dedicated to American designers, doers, and makers.